Here is an article that attempts to explain the mechanics behind Bruce Lee’s one inch punch. “Because the punch happens over such a short amount of time, Lee has to synchronize each segment of the jab—his twisting hip, extending knees, and thrusting shoulder, elbow, and wrist—with incredible accuracy. Furthermore, each joint in Lee’s body has a single moment of peak acceleration, and to get maximum juice out of the move, Lee must layer his movements so that each period of peak acceleration follows the last one instantly. 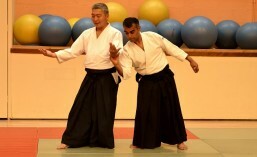 In Aikido we must learn the mechanics of a technique. We must also learn to use our mind and body homogeneously as described above. It is by developing both physical and mental aspects together that our techniques become relaxed and powerful. The physical techniques of Aikido could probably be mimicked by a skilled dancer very easily. However such technique would lack substance and meaning. The techniques must be done with mind and body unification to have value. This unification is taught explicitly in our classes. In fact you cannot progress through our Aikido syllabus without formally demonstrating this understanding.